If you are looking to expand your vocabulary look no further than pig ownership. A pig is a 120 pound ball of muscle complete with teeth and fully equipped to outsmart your every effort to muscle them into making the right decision. In this particular adventure I did not teach my wife or children or neighbors within a half mile any new words. Everybody stayed calm…this time. I’m going to skip to the end then tell you from the beginning. We have learned to modify our schedule and to allow the livestock to dictate the pace. Yes, I wanted to wrap up the pasture change in 5 minutes but it took almost two days. It happened on the pigs’ schedule. When our pigs see us they come running to the fence hoping for a tasty treat. All of their experiences with us have been positive (well, except maybe the castration) and we give them food to reinforce the lesson. If a pig is uncomfortable, no amount of yelling or abuse will make them more comfortable. You just have to wait it out. Patience and kindness. Just moving to a new location is stressful for the pigs. I can only compound that stress by changing from the nice food guy to the mean guy with a stick. 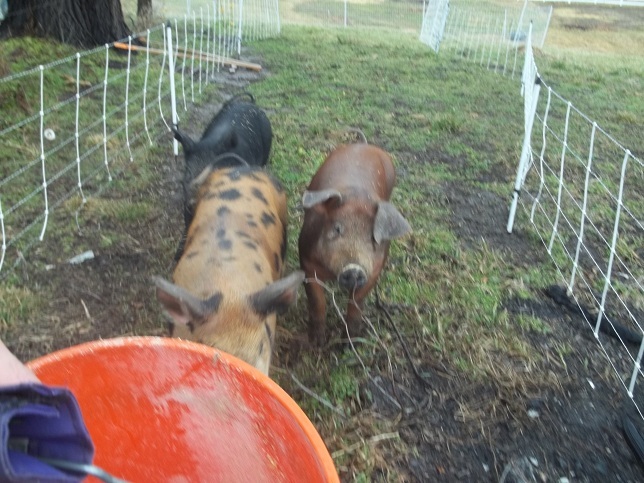 I have to tell you though, as I was standing in the rain Sunday morning I was wishing I had a tranquilizer dart for each pig so I could just carry them to their new pen. Ultimately, patience proved easier by far. 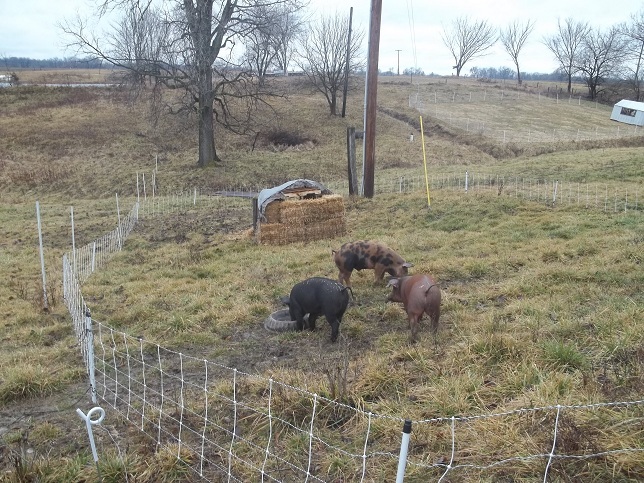 The pigs were still in the winter sacrifice area on pasture and, since their initial (well, secondary) introduction to electric fence, hadn’t gone anywhere. The pigs know that the white wires hurt but they also seem to think there is some sort of voodoo concerning the ground where a white wire once was. 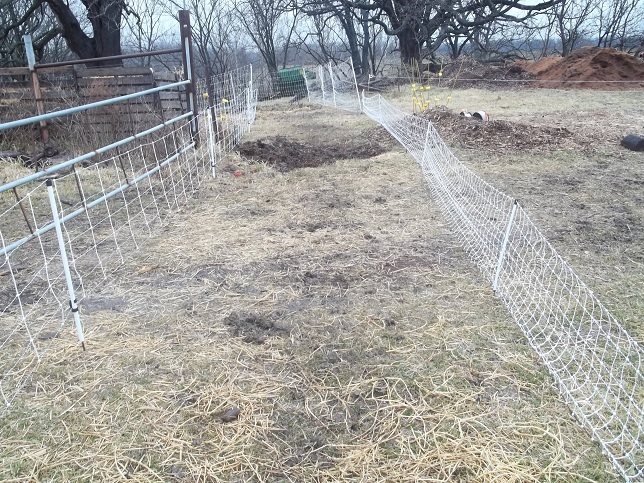 As before, we made a corridor of fencing, initially with two strands of polywire, later with Pig Quikfence. Saturday morning I opened the fencing from their pasture into the corridor then began moving their pallet and straw bale house to the new location 250 yards away. The pigs stood their ground. No amount of scrambled eggs or chicken broth could convince them to budge. Hours pass. The pigs aren’t having any of it. They will not cross the line. At 3:30 I decide to crowd them into the corridor by squeezing their electric fence toward them a little at a time. Everything was going great until the black pig decided his fear of the unknown was greater than his fear of the fence and he attempted to break through the fencing and escape. It was a shocking experience for both of us. 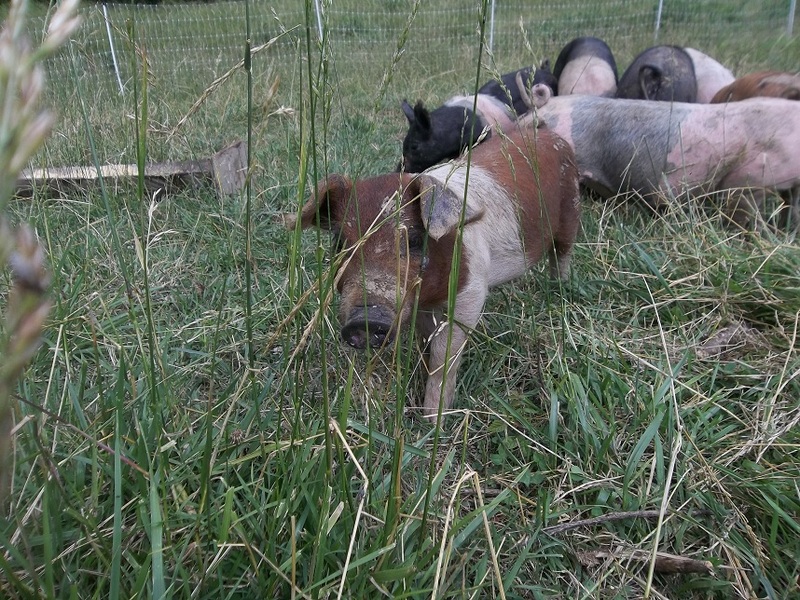 I don’t have to remind you that pigs are distinctly lacking in handles so I found myself wrapped in a tangling mass of electric fence and pork…until we pulled enough of the fence that it came unplugged. Fortunately I had an insurance policy in place…a length of PermaNet surrounding their pen just in case. The little black pig backed his way out of his fence and neither of us were worse for the wear. The fence was not broken, just pulled from its posts and I learned my lesson. Patience. We closed things up for the night and headed off to church vowing to return in the morning. Maybe tomorrow hunger will override fear. After milking on Sunday I turned the cows out and set up the corridor again. The pigs were not interested. I put down a trail of feed hoping they would follow along. They would come up to a certain point. Then they ran back to their pile of straw on the ground. Well, I have other things to do with my time. They can’t escape the corridor so I’ll just check on them from time to time. Around 11:00 I was sent out to the pigs with a bucket of scraps. I placed these scraps deep in the corridor and upwind of the pigs. The red pig (cleverly named “Red”) decided they smelled so delicious he had to get some of that. Spot and Blackie (names just happen with small numbers of livestock) stayed back with a “not fair!” look on their face. Again I walked away. At 11:45 the kids called to me, “Dad! The pigs are in the corridor!” That’s what I was waiting for. I headed out with a bucket full of feed and, like following the pied piper, the pigs were close at my heels all the way to their new home. Nobody was upset. Nobody was abusive. No frustration, crying, swearing off pigs forever or talks with the children about types of language that are acceptable around the house and how sorry daddy is and daddy promises to do better next time then daddy sneaks off to down a highball. Nope. Just pigs following that nice guy who brings them food and a new, fresh pasture full of greens on a South-facing slope. They will get to be here for a few days then we’ll move on to the next pasture. It’s all about disturbance and rest. I need the pigs to work for me. It’s not enough that they get fat and taste great. They have a job to do. But MY job is to help them do their work. My job is to make them happy in their work. I see these animals several times every day. My pigs don’t cower in fear at my approach. They greet me, they grunt at me, they run and skip as I approach (really). Happy pigs. Happy pigs are easy to move. Happy pigs are easy to load. Happy pigs taste better. There is enough stress on livestock. I don’t have to add to it. I can spend two days waiting on pigs to move themselves. It will be even easier next time. This is in response to comments I got on my recent post titled “How Much Could you Make?” Based on comments, my readers saw me as moping because my marketing skills aren’t where I would like them to be. I suspect they are right, though I hope I wasn’t moping. I was trying to say it’s tempting to expand and dive into any number of activities before I’m skillful at any of them. Marketing is pretty far up on the list of things I need to improve but it’s more than just that. My dad recently asked, “Why don’t you get some more layers? That’s money you make every day.” First, I appreciate my dad asking me questions. He’s not questioning my judgement, he sees an opportunity and wants to help me succeed. He’s encouraging me to grow. I think the layers are a good example of why I’m reluctant to grow. A few layers are easy to keep. 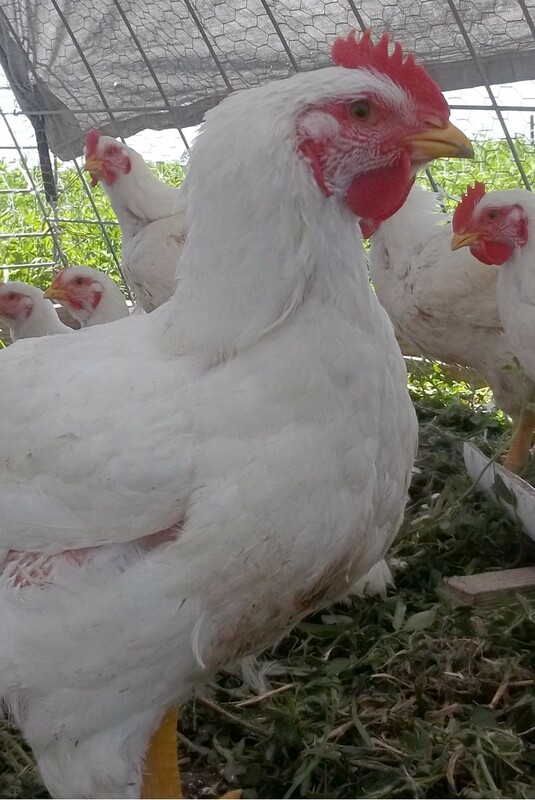 A small home flock eats your kitchen scraps, weeds, bugs, etc. and gives you enough eggs to keep your kitchen hopping. They are entertaining in the extreme. Your only role is to ensure they have water, shelter and protection from everything that walks. 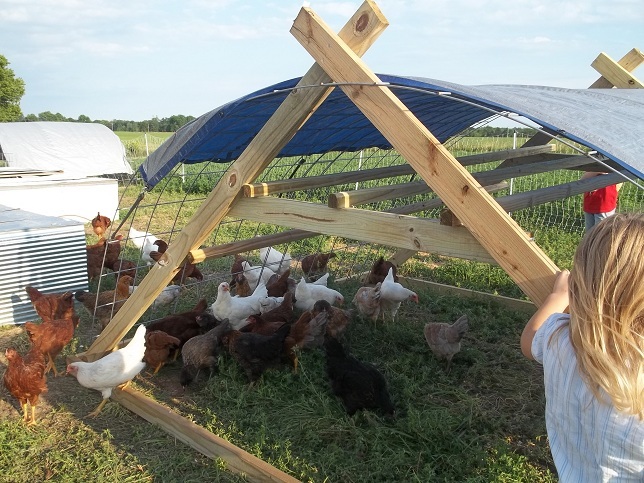 With a small flock the needs of the chickens are few. Now. Let’s shift gears. Let’s go from three birds up to 300 birds. Now you need in the neighborhood of 10 pounds of feed every day. Now you need a much larger shelter. Now you could lose a bird a night for a week and not notice it…that’s bad. Each night we gather or 30 or so eggs in a basket. We bring that basket in the house and set it on the buffet. 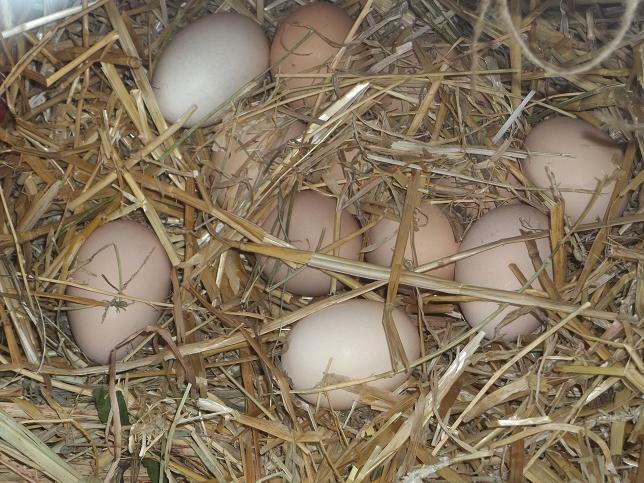 When two baskets are full we set out 5 or 6 egg cartons, sort and clean each egg by hand and label them for sale. 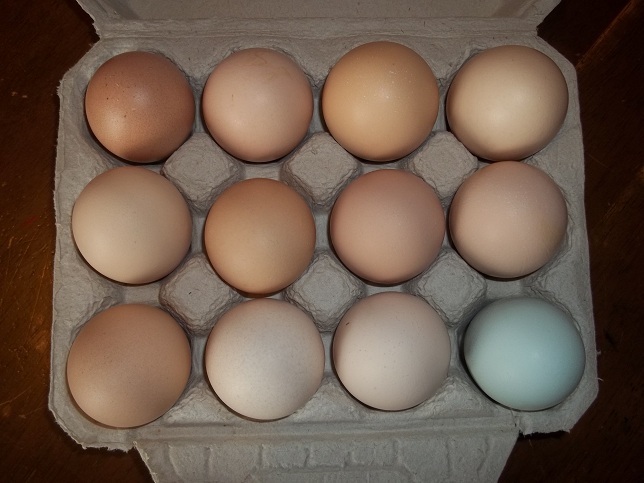 We get somewhere in the neighborhood of 14 dozen eggs each week in the summer, 8-10 in the winter. We try to put an americauna egg in the front right of every box. Blue eggs really freak people out sometimes. While I agree we don’t get enough eggs, that’s where we are now. My house holds 50 birds. That’s it. It’s a portable house. I can’t build an addition onto it. In the winter we house our flock in the greenhouse. I can only fit so many birds in that greenhouse. My infrastructure (or lack thereof) dictates my scale. But my scale is also dictated by other factors. There are only so many eggs I can lug up the hill in baskets. Only so many eggs I can handle, clean and pack. There are only so many hours in a day. I’m nearing the ceiling for my skill level, my children’s ability to help at their age and my availability outside of employment. It’s that last one that hurts the most. I’m not even making enough money to pay the very modest farm payment, let alone live on. I have to find a way to bridge the gap somehow. At this time, we’re adding to our list of products using seasonality on our side. But, as several commenters pointed out, I need to gain more exposure through everything from farmers markets to Facebook. I just have to get out there. But to get out there I have to have something to sell. Now we’re back to the beginning. It is a lot to think about. It’s a lot of work. It’s a lot of time invested in a helpless, tasty little bird with a narrow profit margin when my time is factored in (and I’d rather do nothing for nothing). But it’s exposure. Customers want eggs. You see where I’m at here? I need to grow knowing that not all growth is good. I don’t want to overextend myself but have to do something to move forward. I could quickly become too big to succeed complete with sick animals, neglected children and a failing marriage. I’m using my time, putting my assets at risk and trying to anticipate customer needs. I have to tread carefully.